It may sound cliche, but once you meet Darcy, you quickly realize she truly loves her job. Energetic, creative, efficient and organized, but most of all–an extremely caring person–Darcy is the oil that keeps Mountain Vista humming along smoothly. In May 2014, Darcy celebrated her 10th anniversary as Full-time Service Director at Mountain Vista. Darcy wears many hats–administrator, marketer, facilitator. If any problems arise, you can bet Darcy is the person who will find the best workable solution. Raised as a country girl here in Lander, Darcy has a B.A. in Social Work from Utah State University. She’s managed a retirement RV resort in Sarasota, FL, worked as an Interior Designer on the east coast for a number of years, but now feels blessed to be back home in Lander. She’s married with three grown step-children, a son-in-law, and two grand-children. You’ll find no grass growing under Darcy’s feet, with interests as varied as: backcountry hiking, physical fitness, small-scale gardening, reading political and religious history, and the fun and sweetness of her grandchildren. She also volunteers each year in Kenya to work there with schools and orphanages. To say residents at Mountain Vista both trust and love Darcy is well, another cliche, but maybe you’ve got the idea by now that they’re in good hands. If it’s broken, Debra can fix it! There’s no job she can’t find a solution for. If a broken light bulb leaves the base with jagged glass in the fixture, she simply plunges a potato over the remaining glass and twists. 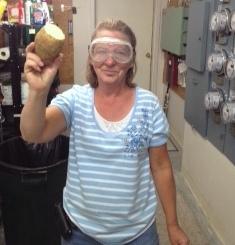 She even remembers to wear safety glasses! With a background in many management positions, including restaurants, stores and a 5-star hotel, Debra knows her way around maintenance. Cheery, sharp and positive, Debra loves the opportunity to keep things “fresh” and new for the mental awareness of all at Mountain Vista. She’s also a great cook, dog lover, gardener, and huntress of wild game. She has great respect for the animals and the food they supply – big game is her and her husband’s main winter food supply, and has a weakness for any book or magazine about homesteading, country living, wagon train and pioneer living.